Given the current state of relations between the NYPD and Mayor Bill de Blasio (spoiler: terrible, horrible, no good, very bad), the mayor has been quick to thank the police force for its strong support of Vision Zero—the mayor's plan to entirely eliminate traffic fatalities in New York City. The effort is obviously an ambitious one, but a year after it went into effect, de Blasio is able to tout some big successes. The administration recently announced that in 2014, pedestrian fatalities dropped to their lowest level since 1910: 134 deaths, down from 180 the year before. (Two caveats: over the last decade, before Vision Zero was implemented, New York City has seen an overall downward trend in traffic fatalities; and, second, 20 cyclists were killed in 2014, up from 12 the previous year.) De Blasio’s Vision Zero plan has three main components: reduce the city's default speed limit, redesign dangerous streets, and curb dangerous driving through increased traffic enforcement. The first of those three can already be checked off the list; last year, New York City's speed limit was decreased from 30 miles per hour to 25. The second is very much in progress; the city announced that in the first year of Vision Zero, it completed more than 50 major street design projects. And the third big piece of the plan—increasing enforcement—appears to be in swing as well. 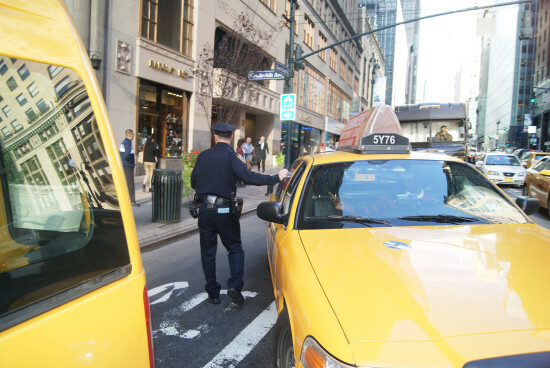 Streetsblog recently went precinct by precinct, crunching NYPD traffic enforcement numbers and found that, for the most part, officers are issuing more tickets for dangerous driving. “Tickets for speeding and failure to yield last year were up 54 percent over the year before, and up 82 percent over 2012′s numbers,” reported the site. “Importantly, the focus of NYPD’s speeding enforcement is shifting somewhat from highways to surface streets, but the pace of change was still very slow in 2014.” In its first full year, the city’s growing speed camera system also issued 445,000 violations. And failure to yield tickets in 2014 were up 116 percent over the previous year. As Streetsblog noted, the NYPD’s stepped-up traffic enforcement is being felt across the city as every single precinct issued more speeding and failure to yield tickets than it did the year before. “Safety is in the eye of the beholder,” says New York City DOT Commissioner Sadik Khan. Khan’s remarks came Wednesday as the New York City Department of Transportation unveiled its new LOOK! 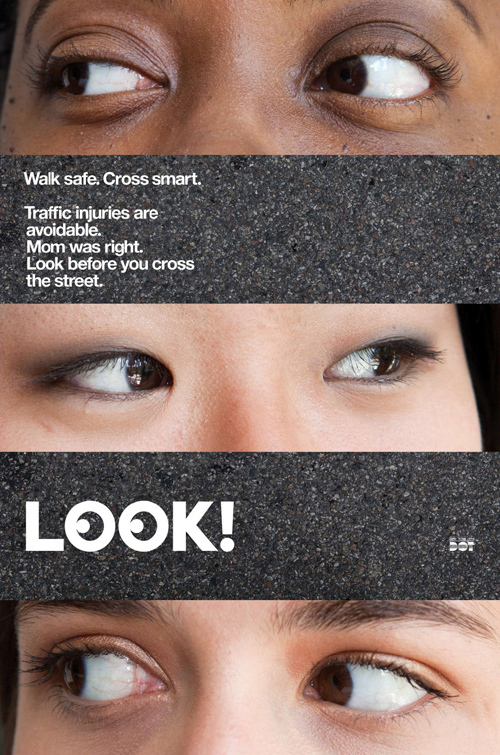 safety campaign urging self-responsibility on the part of drivers and pedestrians alike. The updated campaign features thermoplastic curbside lettering spelling L-O-O-K with appropriately focused eyeballs replacing the O’s on crosswalks at 110 of the most fatality ridden intersections across the city. The street markings are accompanied by witty color photograph ads on nearby phone stalls, bus shelters, and the backs of city buses warning us to heed our mothers’ advice and look both ways before crossing the street. The campaign plans to eventually increase their range to include 200 intersections and more than 300 buses. 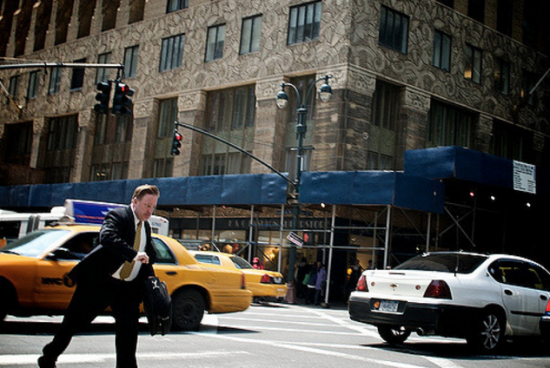 57 percent of traffic fatalities in 2011 involved pedestrians and nearly half of those fatalities occurred during the pedestrians’ right of way, states a statistic provided by the NYC DOT. In spite of this, NYC streets are the safest of their kind with the lowest fatality rate of any US city with a population exceeding one million, according a report written by John Petro of the Drum Major Institute for Public Policy and Lindsey Ganson of Transportation Alternatives. The latest ads follow the DOT’s 2011 safety campaign, which incorporated colorful artwork by artist John Morse and haiku styled safety messages.